Nicely colored up for winter, the Sempervivums are glowing! And a bonus mystery cactus flower! It’s Cactus Jungle in the SF Chronicle. And by inside I mean on the front page. Nice! Laura Wehrley (left) looks for succulents at Cactus Jungle nursery in Berkeley, California, with assistant manager Jeremiah Harper (left back) showing plants on Monday, June 1, 2015. California on Monday officially began its unprecedented push for water conservation in cities and towns, marching out orders for hundreds of communities across the state to make reductions of up to 36 percent. The rest of the article is behind a pay wall, so if you are a subscriber you can read the whole thing! You know, some people even still get the newspaper delivered right to their front porch at home. Nice! New concrete succulent pots available at the Cactus Jungle! Hand-crafted locally by Brian, SukkulentsBYB. 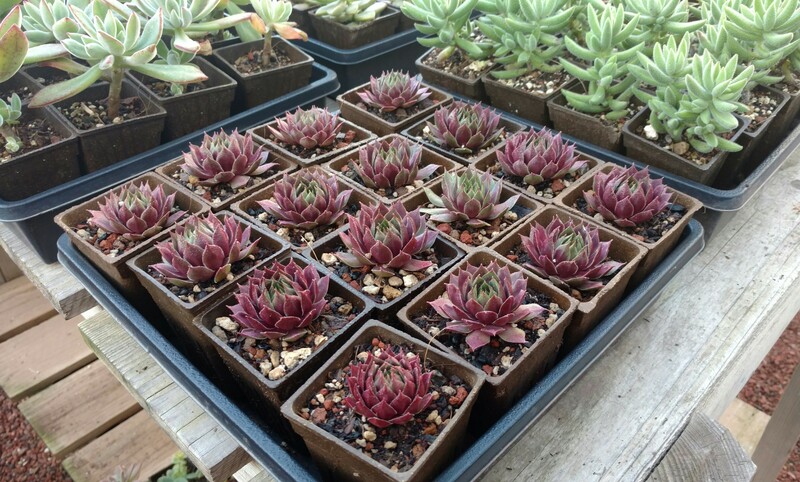 And here is where we pot them up with our very own adorable succulents. Friday March 20 9am – 5pm. Special Dwarf Drosera as seen on our recent Australia trip. We hunted them down! They were near Sydney, in La Pelouse. Right here on the map. Nice! We’re potting up terrariums and mixed succulent pots and filling hypertufa pots with lots of very colorful Sempervivums like this one! It must be almost a holiday type if season coming up. The new giant Palo Verdes, they’re the spineless “Desert Museum” variety, take over at the nursery. You can’t see the store anymore! New terrarium glass arrived today! This case seems a little smooshed. I wonder if it all got broke? Uh oh. It’s Anne’s latest mixed succulent pot. Echeverias in hypertufa? You bet! Very colorful and modern. Practically Moderne. Nice! Keith, at the company party. Angela has been very busy today putting together our biggest Tillandsia selection yet. Is it the Frog or is it the Pitcher Plant?!? Photo by the estimable Anne Smith of the Carnivore Jungle. Western chorus frog on a Sarracenia flava hybrid in the carnivore greenhouse! Rikki’s latest succulent terrarium has already sold. How long was it out? Less than a day. So you know it’s good. Cactus Jungle! with a bit of an autumnal feel to the photo. Or at least that’s what Photoshop calls the filter. I think its a bit of a 70s feel. I was there you know, the 70s man, and I went to those 70s summer camps back then, so that was the filter of my youth. At camp. Not at home, where we didn’t have a particularly filtered life. But camp, well, that was covered in 70s filters. The flowering cactus are out in full force, full bloom, full glorious sunshine today and all weekend long! Now is definitely the time to get an eyeful. These are all what we call Echinocereus grandiflora Hybrids, but others call them Tricho-Lobivia Hybrids. I would tell you why the others are wrong, but that would probably bore you to tears, so I will only leave you with this one word of advice: Don’t trust the Botanists. New Terra Cotta Pottery for Everyone! We had some of our Special Order Pottery just get here this week – A late edition to our Terra Cotta Pottery Sale! Check it out – we have giant terra cotta strawberry pots. Plus cubes and eggs! I don’t use this blog to advertise the business very often, but when I do it’s usually to promote our annual pottery sale. You know you can get 30% off all terra cotta pottery right? Have some pictures of pots! Keith climbs in to the dog beds. Hanging succulent wall panels. Do they make a good gift? No. It is better to keep for yourself. Photo has been irrevocably altered through the magic of multiple photo filters. Do you like the effect? Karsten models the newest Cactus Jungle T-shirt, and it’s blue. With an extra big new logo. Keith models our previous newest Cactus Jungle T-shirt, in a fine charcoal color. And that’s only the half of it. We have 12 in all. Karsten will be leaving to go back east for school. But first a blog shout-out! With Lisa in the background. Look what Rikki has wrought. Matte glazed cube pots with drainage holes! Mixed pots, here we come. Just in time for Christmas. Nicole has been busy making succulent terrariums for the holidays. Every single one gets a mini animal as well as a succulent. Nice! Anne says the chicken is a snow chicken. I doubt it. It looks like a Rhode Island Red to me.